Abou Sarr’s wife wanted to pursue her doctorate in education in the United States, but leaving Senegal, he had to figure out what to do with his own career. “What’s your plan?” he recalls people asking him. “I’m going to learn English and pick up a trade,” he’d say. A friend in the West African nation told him to go to Greenfield Community College. You can get a great education there, he told Sarr. Sarr went to GCC, graduating in 2013 with his associate degree. While in school, he learned English and pursued a career in engineering. As a newly registered alumnus, he spoke to a couple of dozen people at the college’s downtown center on Main Street Thursday for the kickoff to the annual public campaign for the GCC Foundation. The foundation looks to raise $180,670 by May 31 in the public portion of its campaign to complement the money raised so far to help the school reach its $800,000 goal. Campaign co-chairs and others spoke at the breakfast as well. Nicole Fahey, a 2002 graduate and current counselor for substance abuse and mental health at the Franklin County House of Corrections, spoke about the resources the college offers to the community, including programs for inmates to help them pursue a degree. Lorna Peterson, who served as the executive director of Five Colleges Inc. for nearly two decades and is a lifetime member of the college’s foundation board, spoke about the value of the school and her pride in being connected to GCC. “When people ask me what have you been doing since you retired, I tell them, ‘Oh, the most gratifying and important thing. I’ve been on the board of Greenfield Community College Foundation,” Peterson said. The student speakers, recent alumnus Sarr and current student Johanna Hoogendyk, shared why they believe the college has played an instrumental role in their lives and spoke of their mentors along the way. “I have no doubt in my mind that GCC was there to build that foundation for me, changing my life,” Sarr said. His mentor during his years at the college was longtime educator, Kit Carpenter, who teaches English to students of other first languages. At the end of the school year, Carpenter will be retiring after 25 years. “Untitled” 2016 – Johanna Hoogendyk. 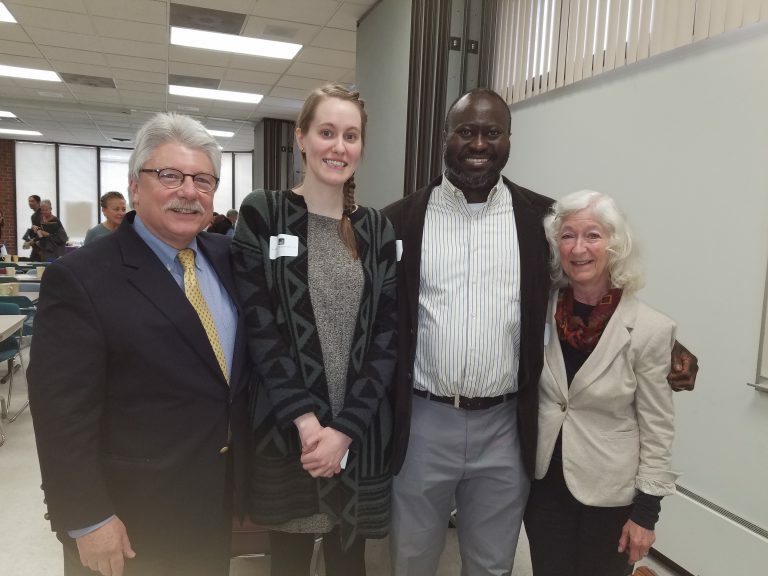 Pictured above: GCC President Bob Pura, left, and long-time educator Kit Carpenter, right, flank speakers Johanna Hoogendyk and Abou Sarr at the college’s annual GCC Foundation fundraising campaign kickoff event. Accompanying Sarr was student speaker Hoogendyk, who spoke similarly about what she has been able to accomplish at the school. She first graduated in 2010 from Greenfield Community College with an associate degree in the liberal arts, before transferring to Mount Holyoke College and majoring in history. Hoogendyk wanted to pursue a lifelong passion in art, so she decided to take a couple of art classes at the community college. Soon after, she was encouraged to enroll and explore her talents in painting. 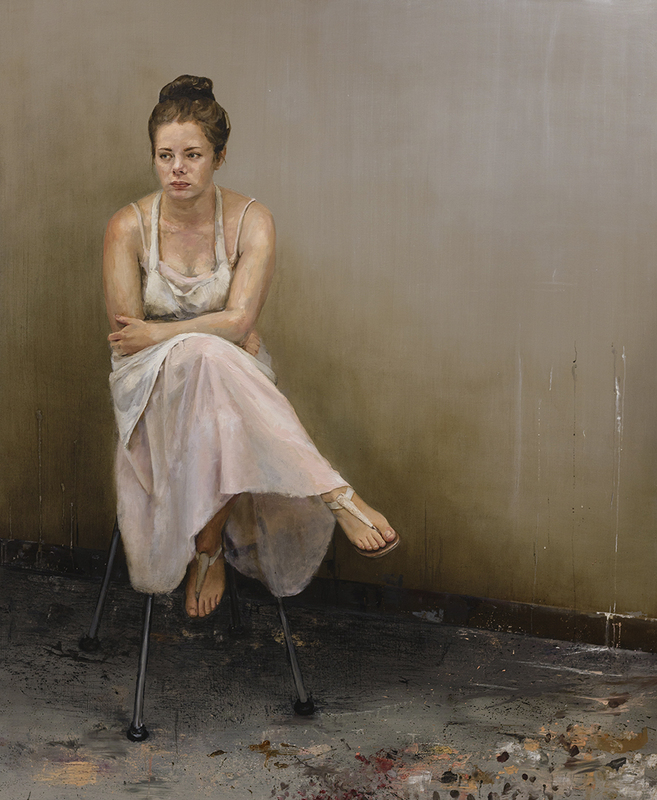 Her life-size portrait of a fellow GCC student will be on display and for sale at the Student Art Exhibit opening on Thursday, April 20 7:00 p.m. at the College’s Main Campus. “At GCC, you arrive and you don’t feel you’re worth it, but they tell you you’re worth it,” Hoogendyk said. After finishing the school year, Hoogendyk will be moving to New York City for graduate school.